A year ago, I walked away from Amazon’s Kindle event thinking that the e-readers shown off there were merely mild, lazy, and ultimately disappointing refreshes of existing models. That wasn’t the case Thursday following the latest round of Kindle unveilings. I had a chance to delve into the new $119 Kindle Paperwhite and its $69 sibling, still simply called Kindle and was impressed by what I saw. In contrast to last year’s tepid crop, this year’s Kindle models make E Ink-based e-readers exciting again. And they leave the competition behind on several metrics. For starters, let’s talk about that catchy name—Paperwhite. The Kindle Paperwhite is still based on E Ink’s electrophoretic ink technology, but this version uses a 212 pixel-per-inch (ppi) 6-inch display. This means 62 percent more pixels than before. By way of comparison, Kindle Keyboard 3G—which incidentally remains in Amazon’s lineup at $139—and the 2011 Kindle and Kindle Touch each had 167 ppi. Interestingly, Amazon simply proclaims it’s a higher resolution display, and no longer quotes actual display resolution on its Kindle specs page; previous models were listed at 600 x 800-pixel resolution. An Amazon spokesperson told me that the E Ink display’s higher pixel density represented a hardware upgrade, not a software upgrade, but I do find it curious that Amazon has shifted away from listing the display resolution. Any and all improvements in the display are frankly less evident when the Paperwhite’s light is off than when the light is on. There are differences, to be sure—as seen by the smoothness of some of the new fonts, and the even speedier page turns compared to before. Once the light is on, though, it becomes very clear why Amazon dubbed this Kindle the Paperwhite: With the light on, the Kindle’s display appeared white, and not the tinted, newspaper-gray color you may be used to seeing on an E Ink display. Amazon says it spent four years working on the engineering behind its front-lit approach to illumination. Fundamentally, the concept is similar to what Barnes & Noble did with its Nook Simple Touch With Glowlight, but Amazon’s implementation appears superior. As you can see the image below, at its maximum output, the Kindle Paperwhite’s light is brighter and more even than on the Barnes & Noble Nook With Glowlight; plus, the Paperwhite has no obvious spillage from the LEDs along the sides. 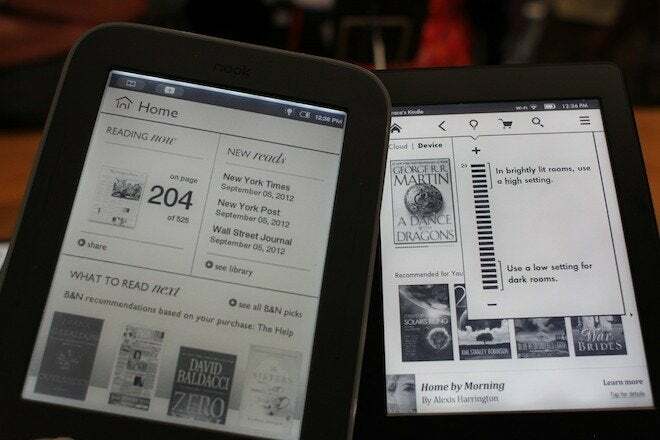 Barnes & Noble’s Nook With Glowlight at left, compared with the Kindle Paperwhite at right. Both have their respective integrated illumination at maximum brightness. The light guides that direct the light across the display sit beneath the display’s standard antiglare layer and new capacitive touch layer. Beneath the light guides sits the actual E Ink display. Also new is a matte surface atop the antiglare layer; this textured layer is designed to more closely mimic paper, and I found this finish definitely felt different and more papery. The Kindle Paperwhite is the first e-reader with a capacitive touch screen. Previous touchscreen efforts have focused around using an optical touch layer. Amazon claims that optical touch technology was the reason it had such an annoyingly deep bezel on the Kindle Touch; I’m happy to report that design annoyance is history with the Kindle Paperwhite. Amazon says the bezel height is 77 percent thinner, and that looks about right; the picture below shows how deep the bezel was on the Touch (on top), as compared with the Paperwhite beneath. Kindle Touch’s deep bezel is no more on Kindle Paperwhite (below). Amazon also says the Paperwhite has 25 percent better contrast, but the company didn’t specify what it did to bring about that improvement. I can say that text did look sharp and clear, with smoother fonts and blacker blacks than on last year’s lackluster models. I’m sure the Paperwhite’s deep black chassis also helped provide the optical illusion of improved contrast over last year’s Kindle Touch. The previous Kindles were more of a silver gray color, and text never did quite stand out, even with upgrades made to the devices over the past year. 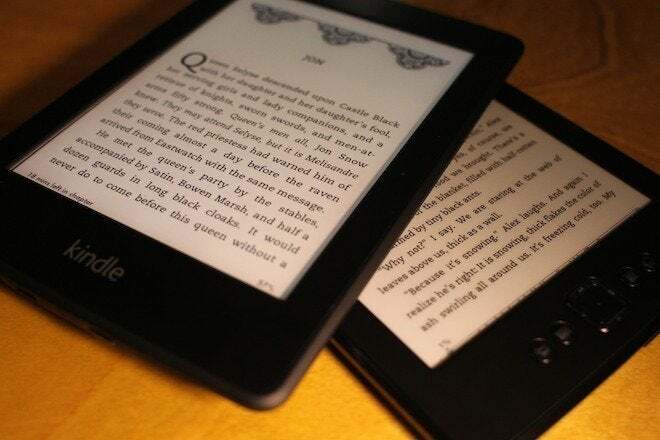 Physically, the new Kindle Paperwhite shares similarities with the Kindle Touch; the two e-readers weigh the same, at 7.5 ounces (or 0.47 pounds), and each share the same dimensions, differentiated by a mere tenth of an inch in height and width, and a rounding error in depth. I found the Paperwhite appealing to hold in one hand; the velvety smooth, rubberized back helped back helped the Kindle stay comfortably in my grip. As before, you get 2GB of storage on-board the Kindle Paperwhite. There’s no microSD card slot, though. And the Kindle Paperwhite is missing the the audio jack found on last year’s Kindle Touch. This omission is especially odd given that the Kindles now support Whispersync for Voice, so you can start reading a book in text and continue it on another device using the audiobook playback. With its new E Ink Kindles, Amazon unveils a dramatic and long overdue update of its Kindle e-reader interface. The software interface on Kindle E Ink e-readers had remained fundamentally unchanged since the early days of the Kindle. Now in its fifth generation, Kindle was ripe for a more snappy looking and visual update. And both the Kindle and the Kindle Paperwhite take advantage of this in spades. Books stored in Amazon’s cloud are a tap away from books stored on the device; the Kindle store is more appealing; and the main menu has been fashioned after the cover-driven views in the Kindle Fire tablet. The graphics look great, navigation makes sense, and the menus I poked through were highly responsive. Amazon put a lot of little touches into the Paperwhite, and one of those is the new Time to Read feature. Seen as a pop-up along the bottom of a page, this feature gauges how long it takes you to read, then reports to you how long it estimates it will take you to read or complete a given chapter. This is a nifty addition that appeals to the reading enthusiast in all of us who insists on just one more chapter…just one more chapter…while reading one of George R.R. Martin’s voluminous tomes at some ungodly hour of the night. While the new Kindle Paperwhite seems poised to be the new e-reader to beat, the updated basic Kindle seems set to stake its claim on the value segment. Still no touch, still using E Ink Pearl, but with better fonts and slightly faster page turns, this model keeps the basics in a familiar, tight package. Ultimately, Amazon has solidified its lead in the E Ink e-reader space in several significant ways. With its $10 price reduction, the Kindle remains the least expensive e-reader on the market. And with its integrated illumination, the new Paperwhite Kindle sets a new standard for performance. Even more important, Amazon has improved the everyday usage experience of the Kindles’ interface, while providing useful and thoughtful touches that readers will appreciate over time. The one key place Amazon still stumbles in a big way is in its lack of support for the Epub standard. The Kindle Paperwhite is available for pre-order now, and ships October 1 in Wi-Fi ($119) and 3G ($179) versions. Both include Amazon’s “special offers” advertisements; you’ll have to pay $20 extra to ditch the adverts. The Kindle costs $69, and will be available September 14. This story, "Hands on with Amazon's new Kindle e-readers" was originally published by TechHive.